According to sources, a new upgrade for the Intel Thuderbolt connectors is underway. The upgrade is rumored to double the bandwidth of the existing product and is aimed at 4K displays. Currently, the Thunderbolt, codenamed “Falcon Ridge” is able to reach 20Gb/s, utilizies the PCIe 2.0 and supports TB and Diplay Port 1.2 nodes. 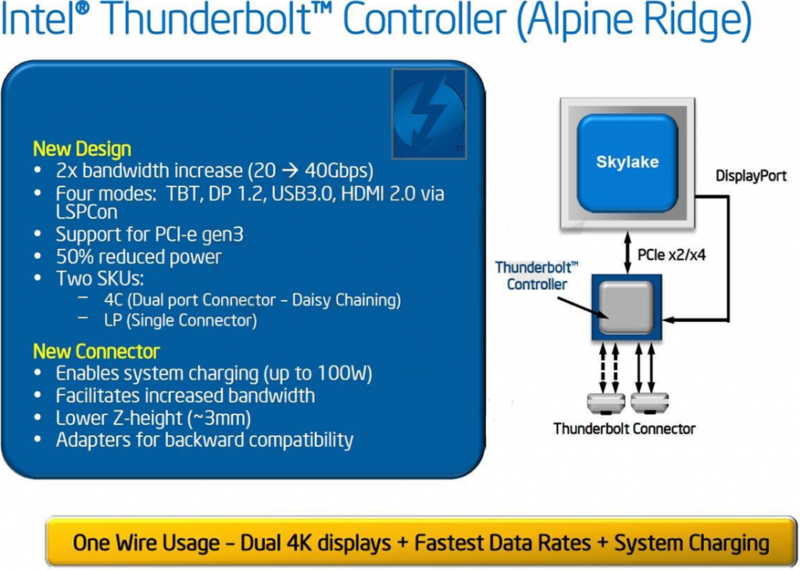 Thunderbolt upgrade, codenamed ‘Alpine Ridge’ to get significant bandwidth, bus and display support upgrades. Details have surfaced, including the slide above which show the specifications of the rumored update. The updated thunderbolt will have an increased bandwidth of 40 Gb/s per single cable. This will be double the bandwidth which the current versions support. Bus support will also be upgraded, to PCIe third generation from the PCIe 2.0 which is currently in use. The support of 40Gb/s by the new interface will be done by using a variety of nodes including the Display Port 1.2, USB 3.0 and the HDMI 2.0. If these specifications hold up then ‘Alpine Ridge’ will allow greater control over Ultra HD video streams during production. There are two expected SKUs : Alpine Ridge 4C with a Dual Port Connector and Alpine Ridge LP with a Single Connector. The newer models are also expected to reduce power consumption by 50%. The new generation will also feature a new connector design. The thickness of the connector is also expected to be reduced to 3mm. This means that present Thunderbolt users will be required to purchase adapters to use with new computers feature ‘Alpine Ridge’. The new connector design will also include charging support for devices requiring up to 100 Watts. This includes almost every smartphone and tablet device out there and adds to the uses of Falcon Ridge from just powering up displays. Backward compatibility will also be maintained. In addition, dual 4K support will also be available. It is not known yet whether Intel will continue its use of copper or switch to optical fibre for data transfers. Alpine Ridge is expected to be designed for support for Intel’s future generation desktop and notebook platforms. Codenamed ‘Skylake’, these are the architectural refreshers scheduled after the current Broadwell. Skylake will be a new PC design using the 14nm manufacturing process. Therefore it is expected that the new platforms will be available somewhere around late 2015 or early 2016. In terms of market share, only Apple currently uses Thunderbolt, with USB having the dominance. However, given the expected release date of Alpine Ridge, we can expect some maturity in overall demands and perhaps an overall price reduction. This might just be the edge Thunderbolt might need for a greater penetration. Thunderbolt PCIe Expansion Cards (Codenamed Light Peak) by Intel Roadmap.